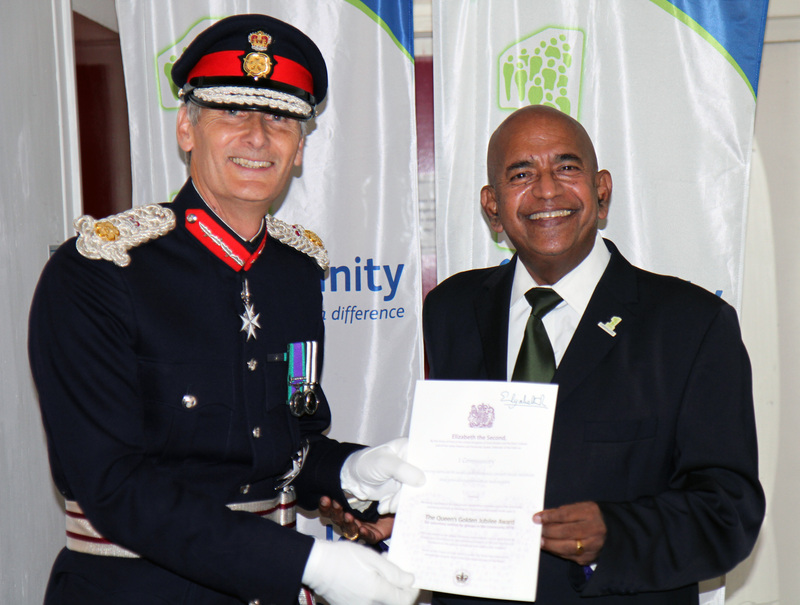 Queen’s Award Presented to One Community. The Lord Lieutenant of Hampshire, Nigel Atkinson, presented the Queen’s Award for Voluntary Service to One Community at a reception held at Eastleigh Museum on Monday 17 September. The award, which was announced in June this year, is one of only 38 made to Hampshire charities since its inception in 2002, to mark the Queen’s Golden Jubilee. It is the highest award a voluntary organisation can receive. Among the dignitaries and special guests in attendance at the presentation were Deputy Lieutenant Joan Ferrer JP; Deputy Lieutenant The Hon Mrs Lovell JP; the Mayor of Eastleigh, Cllr Bruce Tennent, The Mayor of Fareham, Cllr Susan Bayford; Cllr Charles Choudhary, Vice Chairman of Hampshire County Council; and Paul Sapwell, Chief Operating Officer of Hampshire Cultural Trust; along with trustees, senior managers and representatives from among One Community’s 170 volunteers. The Lord Lieutenant was fulsome in his commendation of One Community, the quality of our governance and the difference we make to the people of Eastleigh and Fareham. The award was accepted by our Chair of Trustees, Professor Sri Kandiah, who spoke warmly about the organisation, its volunteers, staff and beneficiaries, and what the award means to all of us. Our Chief Executive, Jean Roberts-Jones, made a closing speech of thanks, outlining the charity’s areas of service and what they mean to the individuals concerned.